Tis the season to be busy and also get your sweat on! Get ready to gear up for the holidays with this 12-Days of Fitness Challenge. There’s nothing better than feeling accomplished and seeing improvements over a set period of time. This challenge is effective and can be accomplished in a few minutes a day. Taking on this challenge is an experience. It’s a time to appreciate your strengths and learn what you could improve. It will also help keep you trim as you enjoy the season’s festivities. Deck the halls and trim your tree…because you have a sweaty holiday treat to accomplish. Gain knowledge from the experience! The 12-day series starts easy and builds up into more intense challenges as the day’s progress. The moves are simple, but you can advance them to challenge your own fitness level. Starting with small tasks will ensure you stay on track. After the first few days, the series will get more intense to allow you to improve upon what you started. The daily workouts are designed to focus on a different muscle group each day. Follow the prescribed reps and sets as directed each workout. Challenge your strength level each workout. Complete the ‘Daily Challenge’ by the end of each day. This is day number 4 of the holiday challenge; if you’re just joining in now, please refer to the 1st Day’s blog and video to get the full program details. The 4th day is a ‘total body’ workout compiled of 6 exercises chosen from the previous 3 days. Therefore, you should be familiar with these movements. Note: We chose the ‘total body’ exercises for you, however, if there are ones you prefer doing instead, choose 2 exercises from each 3-day block (days 1-3) to create your own ‘total body challenge’. The 4th day of Fitness challenges the TOTAL BODY. Perform 10 reps, 1 set of each exercises listed below. 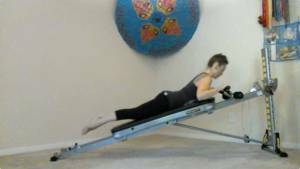 Adjust the incline to accommodate and challenge your strength level. Begin each workout with a dynamic warm-up & conclude with a cool down. Check out the video to see how these exercises are performed! Stay tuned for the 5th Day of Fitness Challenge. Mark Scally is an athlete and player development coach committed to achieving high performance through specialized training. Mark’s background in sports focuses primarily in ice hockey where he had played four years at the collegiate level at the Pennsylvania State University and five years at various professional levels around the US. Starting in 2000, Mark had participated in two NHL training camps with The Pittsburgh Penguins and had played for minor league professional teams in the AHL, ECHL, and SPHL. After retiring from professional hockey in 2005, he continues to train as an athlete himself as well trains others in hockey. Mark also has a notable background in golf where he competed at a young age and played for a year on the Pennsylvania State (NCAA Div I) golf team. Mark continues to be an active golfer competing in local events on the amateur level. Balancing life outside of athletics, Mark is currently a registered professional civil engineer who performs engineering services for water infrastructure projects for a private consulting company. Regardless of type of sport, activity, or for general wellness, Mark is passionate about training. He has adopted a functional training style that involves cardio, strength, plyometrics, and agility exercises that are effective for all sports and also support a healthy lifestyle. The benefits Mark focuses on are improved strength, stamina, flexibility, and injury prevention. With a properly managed diet, Mark’s training will promote muscle development and excess fat loss, which can be calibrated based on your goals to make the best athlete out of all of us! What Is Hot Yoga and What Are the Benefits and Risks? Can I Work Out If I’m Sick?